This is a guest post that I submitted! It’s my 2nd guest post and I wanted to post this on my blog in case you don’t follow my company’s website. To get more business insights, visit my twitter page! Last year saw the emergence of lots of marketing innovation and creativity. A new year has begun. RevUnit has twelve 2016 digital marketing technology predictions for 2016 we think you should care about. Check out all twelve below. Facebook’s relationship with small business owners has been up and down. For the last few years getting any kind of significant viewership from your own fan page has been tough. But, 2016 will be the year small businesses and Facebook will start being BFF’s again. Facebook wants its pages for customer communication instead of a promotional megaphone. Small business owners will need to understand their audience better than ever. Facebook is helping businesses understand their customers better, making it easier to create conversations. Time spent on targeting content with customers will drive more awareness and sales. If you haven’t heard of audience insights, we suggest you check it out. A great example is the new “Messenger for Business” app which allows customers to chat with businesses real-time. Along with Facebook’s SMB efforts, Facebook Video has shown serious media engagement. Videos outperform Facebook news feed posts and get more views compared to YouTube. Success versus YouTube could be because Facebook plays videos automatically and counts a view after only 3 seconds. But don’t let that fool you. The numbers don’t lie. 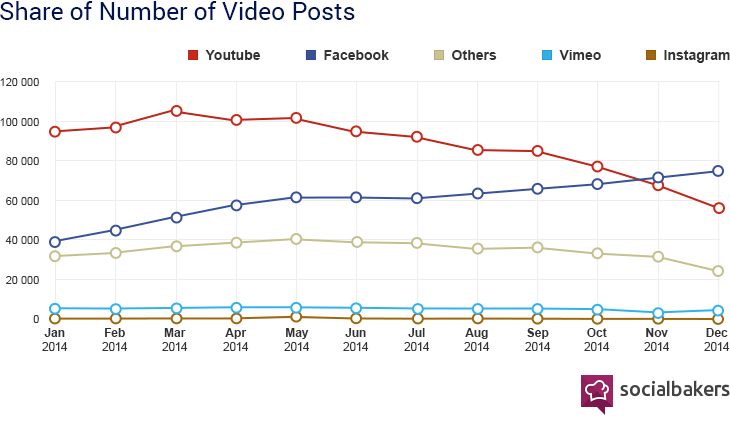 Since 2014, the number of shared video posts from Facebook has increased while YouTube has decreased. Engagement is higher from Facebook as well.If you want more brand engagement, try Facebook Videos. More and more people are going out of their way to find great places in their towns to shop, eat, and spend money. For example, despite Amazon’s massive dominance, used bookstores are still thriving. Search engines have been focusing on personalized search results for years now. 2016 will be the year local businesses will gain much more visibility compared to years past. Thanks to contextual search, customers will see more local businesses compared to national brands. If you are a local business, you can have steady growth with solid SEO and proper microdata. 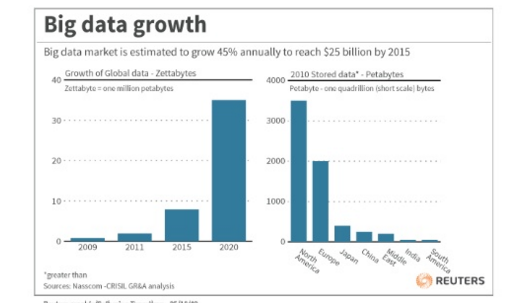 The growth of data alone year to year is moving at an astonishing rate with an estimated 45% annual growth of data. Understanding the market and how customers react is no longer a mystery. Marketers can now hyper focus on demographics and see how users interact with their brand. Using tools like Facebook’s audience insights can unlock information about your ideal target market. Another free tool for audience insights is Google Analytics and Search Console. Both tools update their platforms regularly. The world of data science has been booming in the past few years. With the abundance of data collection, companies are trying to figure out what it all means. The industry is using predictive analysis to understand trends and solve real world problems. All this information is waiting to be used by data analysts and scientists alike. Interestingly, Harvard Business Review calls data scientists “the sexiest job of the 21st century”. With a massive demand from startups and Fortune 500 companies, it’s not hard to see the importance of data science. 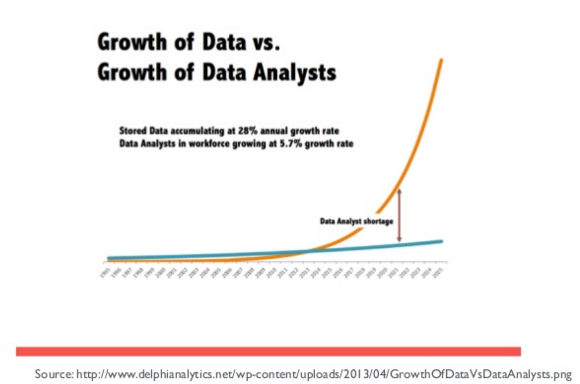 Data usage is growing faster than the number of data scientists. Creating massive industry shortages in skilled labor. Experts will use the power of data more in 2016 as the cost of data science becomes more affordable. Not long ago, few barriers existed in entering the emerging digital marketing industry. Just “learning” digital marketing skills won’t be enough to be successful against a matured competition. Especially in the outsourced parts of the marketing services industry like SEO & PPC. Digital marketing requires experience and expertise. Many aspects of digital marketing are beginning to mesh with traditional marketing methods as brand building will take precedence over metrics such as “organic traffic”, “impressions”, and “video views.” Customer retention, consumer packaging, and company messaging are just a few items digital marketers need to think about in 2016 and beyond. If you have been paying attention to this post, you’ll notice the underlying theme is data, data, and more data. Understanding how to locate data, digesting it and understanding what it all means will become a necessary skill for top level marketers. Learning such languages such as SQL and understanding databases & visualization tools such as Hadoop, Spark & Tableau will be a key into diving into the whole realm of digital. The moment I downloaded Periscope and used it for the first time I was a big fan. This is a biased prediction, but we think Periscope will be the fastest growing app in 2016. Periscope allows anyone to stream real life in real time from across the globe. Bored at night? Watch a live stream during the day in Japan! Periscope does have some competition with Meerkat. 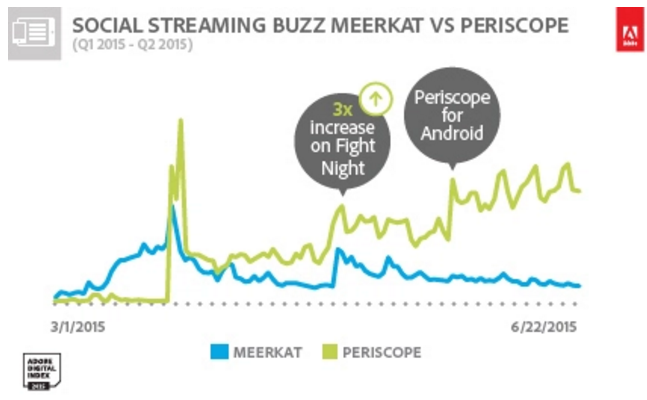 But since mid-2015, Meerkat’s user experience shortcomings have cleared the path for Periscope’s growth. Periscope announced they had 10 million users as of August 2015 compared to 2 million users for Meerkat (as of May). 2015 was the year of Periscope discovery and 2016 will continue that trend. But the number of celebrities and companies that will start utilizing this will increase. Early adopters will see big dividends as they build large and engaged followings with little competition. Imagine something as cool as Uber or Lyft sponsoring a real life “cash cab” show live through Periscope. Or perhaps having professional sports teams stream their locker room after a game. Periscope is still in its infancy stage right now, but the possibilities are endless. Mobile usage has been growing at a blazing pace for many years now and shows no signs of slowing down. At the same time, as more people get acclimated to having their smartphone as an extension of themselves, convenience will be the key for “the next big thing”. That might not be surprising for most readers out there. But what we think will be a unique turn of events would be a newfound openness of people who are willing to give up some of their privacy at the expense of convenience. Years ago it seemed that everyone was talking about being the importance of smartphone privacy and understanding what is/isn’t collected. Consumers are getting to the point where they no long feel insecure about privacy. To me, it isn’t far-fetched that a person will willingly submit all their demographics, shopping habits & interests for the sake of having a more convenient way to shop or make certain actions. It would almost be a blend of Facebook’s ability to take a person’s data plus Netflix’s ability to find the potential shows and movies that a person would enjoy based on their habits. As top digital brands continue to find ways to monetize, you’ll begin to see more ways to buy anywhere. Pinterest began implementing the buy button in 2015. Instagram & Google (mobile) are testing out buy buttons as well. Since Oculus Rift pulled into the market, people are taking virtual reality serious. Will virtual reality hit the mainstream in 2016? Maybe not. But, early adopters will pave the way as VR capabilities will continue to expand. Businesses have reached the point in which they can spend resources on learning more about data, analytics, and understanding what it all means. As a matter of fact, Inc.com recently listed 53 startups that could potentially take off in 2016. Of these 53 startups, 15 (28%) of them involve big data, analytics, and visual reporting. From oceanic data capture to impenetrable databases, data will play a big part in 2016. What are your 2016 tech predictions? I’m interested in hearing your thoughts.